Blackbird debuts at NAMM 2014 an acoustic ukulele with an emphasis on sustainability. Gretsch will introduce at NAMM 2014 five new ukuleles from its Roots Collection. 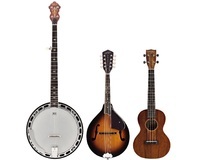 Gretsch expands its Roots Collection with two new banjos and one mandolin. Merlin, this is the name of the new diatonic stringed instrument Seagull will debut on January 23rd at Winter NAMM 2014. The classic Fender electric mandolin of the 1950s and ’60s returns as the new Mando-Strat with an updated and improved design. Morgan Monroe introduces its MMT-1E Solid Body Electric Mandolin. The Loar and the Mandolin Cafe will give away one LM-700-VS mandolin to a visitor to the Mandolin Cafe website. Eddy Finn introduces new models of ukuleles made of bamboo. Recording King introduces the RK-R36 and the RK-OT25.